Hey guys! We are the Mueths (pronounced mee-th). I’m Holly and my husband Jon and I are thru hiking the nearly 500-mile Colorado Trail (CT) in 2018. Our beagles, Buster and Izzy, will be joining us. Southern Illinois is our home but our hearts belong to the mountains. I’m a High School nurse and Jon is a 7th and 8th grade math teacher. Our jobs are perfect for us and we can’t imagine giving up the wonderful opportunities we’ve received. Jon works in the same town where we were both born and raised and went to school K-8, how cute is that?! So, how do we fulfill our dream of thru hiking? 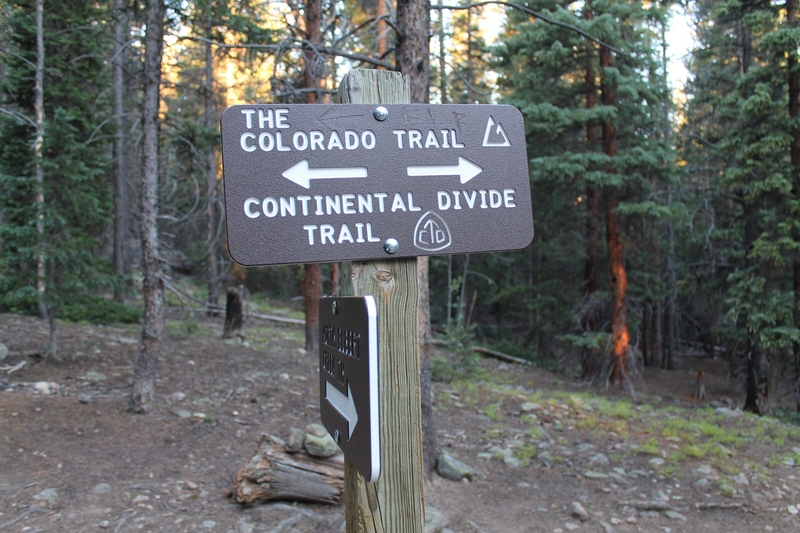 Logistically, the Colorado Trail can be hiked during our summer break. Our long-term goal is to section hike the Appalachian Trail, the Pacific Crest Trail, and the Continental Divide Trail (dream big, huh?). Completing the CT this summer will give us an entire trail under our belt to help motivate our future section hiking endeavors! We were married on October 31, 2015 and honeymooned in Colorado for 2 weeks the following summer. On our way up Mt. Elbert, the tallest 14er in Colorado at 14,433 ft, we realized we were walking on the Colorado Trail and the Continental Divide Trail for a stretch and even passed a young woman hiking a section of the CT. That’s all it took for my husband to start searching the internet about this trail neither of us had ever heard about. At the top of Mt. Elbert, we thought, “is there really anything better than being out in nature?” Solitude and beautiful mountain views surrounded us and gave us a feeling we wanted to hold onto. Shortly after our honeymoon, Jon suggested that I leave my year-round job as a cancer nurse for a school position to open up our summers. I began my first year as a school nurse in August 2017 and that’s all we needed to decide that our thru hiking adventures would begin the summer of 2018. What better way to do it than to revisit the place that made us fall in love with hiking in the first place, Colorado?! Mt. Elbert trail crosses paths with the CT & CDT and even shares a short section with the CT.
Why follow us on the Trek? Jon and I are fairly beginner backpackers with two very active beagles. I can guarantee a lot of funny stories with many failures and successes along the way. No one we know personally has ever done anything like this. Everything we know so far is from one weekend backpacking trip, some stationary camping, and multiple shorter hikes. I bet a lot of people think we won’t succeed. We are a little unsure of what this whole trip is going to look like with two dogs. But you can bet that we are willing to give it everything we’ve got to make it happen. Our Christmas break was spent organizing our hiking gear to get a better idea of what we still need to buy, planning every weekend hiking and backpacking trip from now until we leave for Colorado (mid-late June), and preparing ourselves for a fairly hard training schedule to get us into shape! We hope you enjoy learning from us and following our journey! How awesome…..good for you guys!!! Can’t wait to follow you two on this journey! I just had a life long friend do this on the Appalachian Trail. He loved it! Thanks Anna!! Was it Jimmy Ross? Someone was just telling me about him last night! This is SO cool! I’ve wanted to take up hiking for a long time. One of my retirement goals! Following your hike!!! Enjoy your journey! Holly, I’m so excited for you and your husband. I can’t wait to read your posts and see your pics. What an awesome adventure!